Growing up in Louisiana, I thought I understood “good food,” but my after my summer in Italy, my taste buds are forever changed. I have never in my life tasted food as fresh, unique, and flavorful. 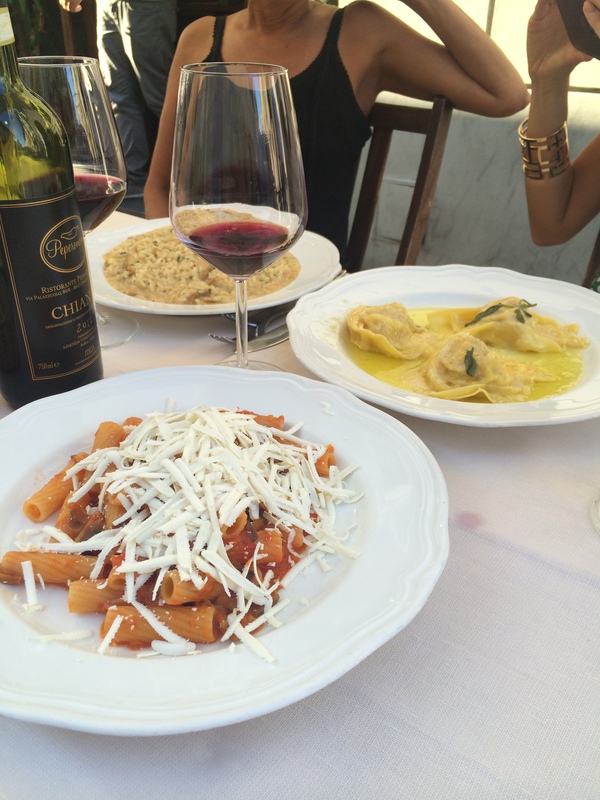 I was able to travel throughout Italy before my program started in Rome, and I can honestly say I never had one disappointing meal. Of all of the calories I consumed, there are several that stick out in my memory, and certain dishes I would urge anyone traveling to these parts to try! While we were in Cinque Terre, we had anchovies that were unbelievable, especially compared to the anchovies I had tasted in the States (which I immediately spit out). Since Cinque Terre is on the coast, they are extremely fresh and tasty rather than salty and super preserved like the anchovies I have had in the States. Cinque Terre is also known for their pesto and white wine, so eat/drink both with anything and everything if you get the opportunity to visit this beautiful place! In Positano on the Amalfi Coast, we had calamari from various places, and they were all absolutely amazing. 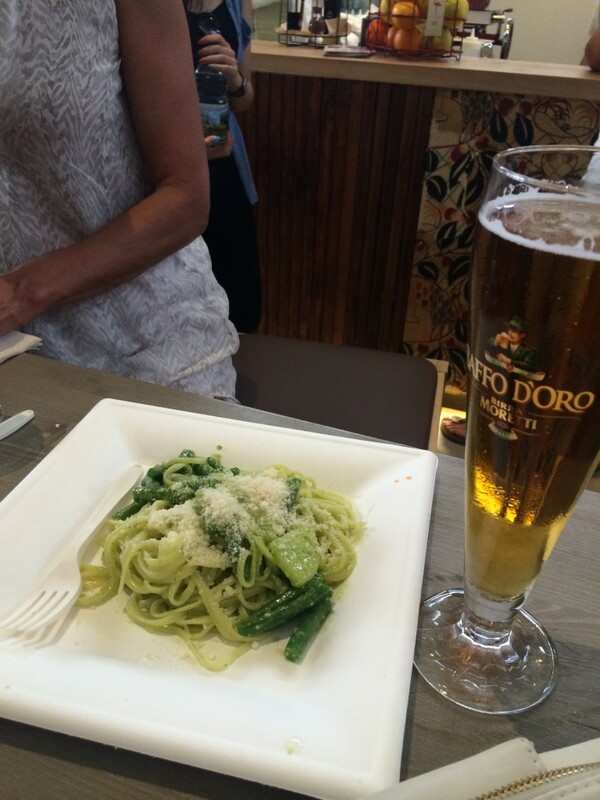 This is also where we discovered our favorite Italian beer, Peroni. 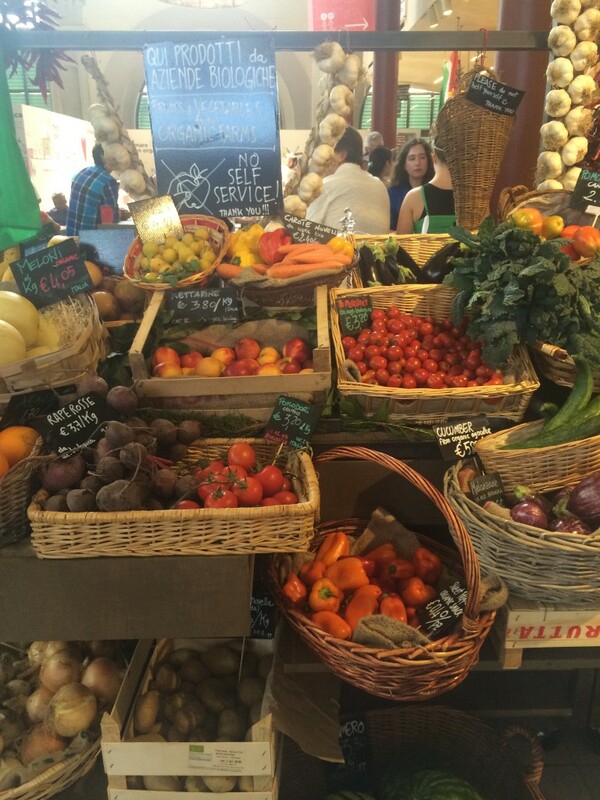 In Florence, there was the coolest, two-story market that had over 15 vendors selling an assortment of food. You could get anything imaginable, and every dish was made right in front of you! We also went to a pizza joint called Gusta and it was by far the best pizza I had during my entire stay in Italy. Art Bar is a hidden spot near the Arno River, and it was actually Kate Middleton’s favorite spot when she studied in Florence. We ordered the Pina Colada which will knock your socks off. Each drink is literally a work of art and the fresh mint they put in the colada was the most simple, yet amazing touch! Lastly, Sei Divino was a wine bar/restaurant we stumbled across on Yelp and it turned out to be the highlight of our stay in Florence. We ordered a meat and cheese tray appetizer (I wish I could remember the exact name), which sounds very basic, but it will change your life! They also made specialty cocktails that were unlike anything I have every tasted! It is definitely a must for anyone who goes to Florence. On my second trip to Florence, my teacher took us to his favorite food and people-watching spot. It is called Gilli, and it’s located in Piazza, so it is the ideal spot to watch locals and tourists, and the food is amazing! 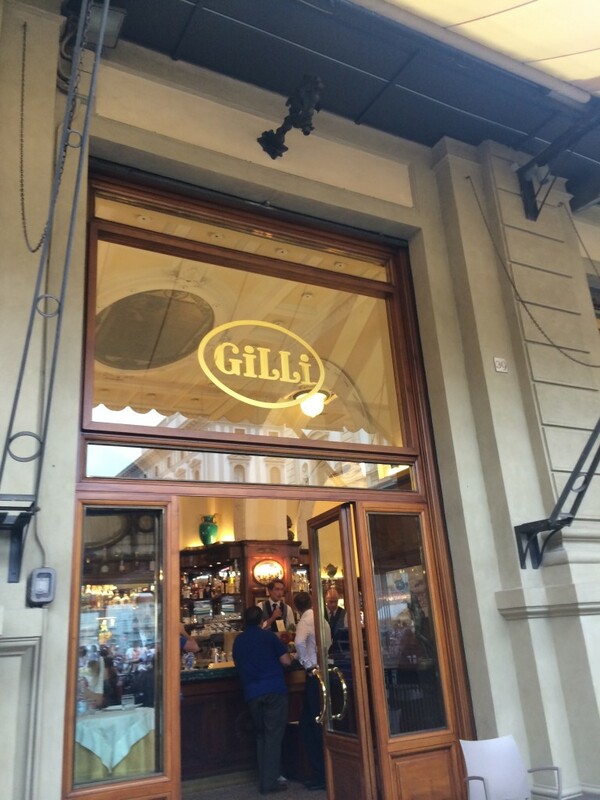 I had the Gilli Salad which was pretty good, but I would recommend the gnocchi – it was much better. Definitely get a cappuccino, too, while you sit and enjoy the view! Rome was filled with delicious restaurants and cafes. Some of my favorite dishes were anything with truffle or truffle oil. Although this is where I spent the majority of my time, I limited the amount of meals I ate out to save money for weekend travels. Instead, I would go to the market down the street from our dorm every other day to buy groceries for my meals, which turned out to be my favorite part of living in Rome! I have never seen, nor tasted such fresh produce as the fruit and vegetables I would buy at the market. They also had fresh cheese, meats, and just about anything your little heart desired. I have always been a huge fan of farmers markets, so I went to one in just about every city I traveled to this summer. I encourage all of the foodies out there to do the same wherever you get the chance to travel! The gelato is the best in Rome, and never mind the calories because you walk all day, everyday — so eat it every chance you get! My favorite gelato places were: La Romana by Termini Station (every flavor is amazing — and yes, I tried them all), Gelateria dei Gracchi (in the Prati neighborhood near Vatican City). There are tons of other amazing gelato spots around the city, but be sure to stay away from the puffy looking gelato. Although it is pretty, it is not the real stuff. While you are in Rome, you must make your way to the Trastevere neighborhood. This is the true “rustic” Rome and there are amazing eating spots on every turn. You can get authentic Italian food just about anywhere in this neighborhood and be sure to check out the tents along the Tiber River. They have cute shops and restaurants, and it is a great place to go at night. The best tips I can give when it comes to eating and ordering abroad is to always ask the waiter what they recommend. We always loved the dishes that were recommended to us compared to whenever we just ordered blindly. Do not be afraid to expand your palette and taste things outside your comfort zone! Things taste amazing when they’re fresh and prepared properly, and every food in Italy falls into both of those categories. Splitting dishes allows you to taste more, so ordering two or three things between three or four people is ideal because you get to taste it all and save a little money for gelato afterwards! Take it from Randi — if you’re a “foodie,” this is the trip for you! The possibilities are endless. You’ll be scarfing down pizza, pasta, and gelato faster than you can say “Buon appetito.” What are you waiting for? GO:Rome!